SULLY, the new film directed by Clint Eastwood which stars Tom Hanks as heroic pilot Chesley Sullenberger, takes viewers through the experience of “The Miracle on the Hudson” and its aftermath, showing it as far more than just the harrowing yet successful landing of 155 passengers and crew in the frigid waters of the Hudson River on January 15th, 2009. With its focus on the event itself and the immediate days that followed, including a review and investigation by the NTSB, SULLY encapsulates that short period of time and its effect on the pilot. Is it a feel-good movie about an unprecedented feat of aviation skill, or is it a cautionary tale that no good deeds go unpunished? Either way, is it a movie that deserves to attract an audience? 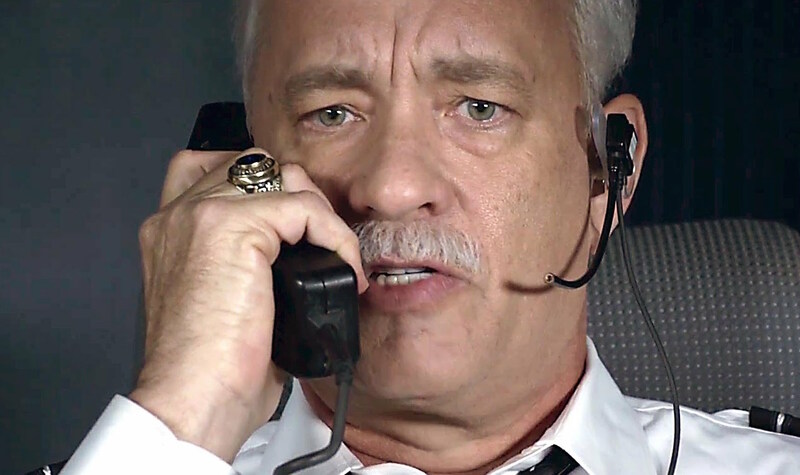 Tom Hanks leads a great collection of actors, all of whom represent real people, and while beyond sporting Sully’s snow-colored head of hair, Hanks looks nothing like Sullenberger, he captures his self-effacing yet quietly confident personality. He is truly the main reason anyone should go see SULLY. He portrays the difficulty Sully had dealing with press, his own trauma from the incident, and his nagging fear he didn’t do the right thing with subtlety and grace. Laura Linney, as his wife Lorraine, does as much as she can with the screen time she’s given, although she is in peril of being pigeonholed in the long-suffering wife role. Aaron Eckhart plays co-pilot, friend, and fellow survivor Jeff Skiles straightforwardly and with sincerity. A cavalcade of character actors you’ll recognize portray cast and crew members. The problem is SULLY can’t decide which story to tell. There is the one about the amazing success of keeping 155 people from dying in a horrible plane crash, and the joy that erupted around the country and world afterwards. That one would include getting to know and seeing the various experiences of not only Sully himself, but all the surviving passengers and crew, the air traffic controller involved, the first responders, and their families, and even the people of New York, who, as mentioned in the film, deserved good news relating to a low-flying airplane. That would be more like an AIRPORT movie based on real-life. Then there’s the story about the investigation that threatened to ruin the career of a man who had done something no one had ever done before, after an incident that had never been recorded, causing officials to search for pilot error. That would involve more of those conducting the investigation, including the various members struggling to do their job in the face of such positive press and public celebration. In attempting to tell both of the above, it tells neither to great satisfaction. Sometimes telling rather than showing is done, as exampled on the several occasions when reporters actually do the task of stating things that could have been leveraged through story or character, like the statement one made about needing a good story involving an airplane in New York, since it was less than a decade after 9/11. The film essentially vacillates between presenting Sullenberger in slice-of-life experiential fashion, as he awkwardly navigates the days following his “forced water landing”, and repeatedly showing the “miracle on the Hudson” from different vantage points, perspectives, and simulations, almost Rashomon-style. As such, the pacing becomes an issue, as does the editing and flashbacks. It also doesn’t give any other people involved in the experience enough depth, backstory, or screen time to give their part in the proceedings emotional context for the viewer. If screenwriter Todd Komarnicki and director Eastwood chose to show bits of story about certain passengers, or wanted to show us a bit of what Lorraine Sullenberger was going through, including how she was processed almost losing her husband and dealing with the press camped outside their house, they would have had to commit to those choices, not toss them in partly formed. Asking co-star Laura Linney as co-star to play almost exclusively against a phone isn’t beyond her skill sets, it’s just a waste of her talent. The way Eastwood and Komarnicki chose to represent the incident itself, first in parts, through Sully’s nightmares, then in simulations when the investigation is attempting to prove he could have safely landed at a nearby airport, then from beginning to end, with the actual experience played with the voice recording, becomes repetitious in the extreme. The exclamation of “Birds!” was said so many times it threatened to become funny, which, if you ask anyone who survived this event, is the last thing it should be. To be sure, there is a celebration of skill and humble heroism, as well as the survival of no less than 155 people with loved ones and lives to live on which viewers can focus. There is also the ever-impressive acting prowess of Hanks capturing spot-on the reticent real-life hero, whom we actually get so see onscreen at the end of the film, as well as the recreation of the event itself, as terrifying as it must have been, captured with impressive believability with special effects. Editing and tonal inconsistencies notwithstanding, if those aspects sound compelling, it might be worth the price of admission.